Oratorio. Opera. Popular. Sacred. She could — and did — sing it all. Genes, training and hard work conspired wonderfully to create my mother’s soprano voice with the sweet clarity of a nightingale and power to fill a huge auditorium. Most of all, though, was the emotional impact. From recording her first studio “78” in the mid 1940s until the end of her singing career in the late 1980s, she could hold your soul in the palm of her hand and make you believe she was singing directly to you even though you were in a crowd of hundreds. Mum has an emotionally rich personality that dramatizes her singing. She loves people. She cares deeply. She empathizes. It all found expression in her singing. She is totally head over heels in love with God, and her devoted life has through the years enriched the spiritual journey of many in her household of faith. Age and illness has silenced my mother’s beautiful voice. But not her heart. Then came the brain tumor. Symptoms — diagnosis — shock — fear — options… the sequence familiar to many. Pathology: “benign.” Great relief. “But it will still kill her by pressure on the brain as it grows” — fear revived. In the end, surgery saved her life, but it damaged facial and auditory nerves enough to end a wonderful singing career. As if he had created this ugly anomaly. As if time and chance had played no role. As if I’d have been more compassionate to my mother than he seemed to be at that moment. Thank God for his mercy to us in our pain-driven frailty (Psalm 103:12-14)! Mum’s faith and deep love for God helped her come to terms with it before the rest of us did. We did, though. We all do eventually — in our respective trials — if we remain “in him” (John 15:4). For 20 years now, we’ve accepted that it was great while it lasted. We’re thankful that Mum has precious memories of a 40-year experience, but realistically, it’s well-and-truly over. Or is it? Isn’t it? Flashback — 1960s: As I grew up, there were two versions of my mother. There was the view from the front, the perspective most people had. She would come on stage, facing the congregation and enthrall them with worship music. Then there was the view from the back. What I call “hindsight,” the side of Mum that most people didn’t get to see. She’d sit at the piano, learning a piece. She’d stand by the piano while her accompanist and she rehearsed. And the way our home was configured, whenever I passed by her on such occasions, I could see her back and shoulders moving involuntarily, rising, falling, swaying mildly, moving with the feeling and sincerity that so typified her singing, particularly of sacred music. 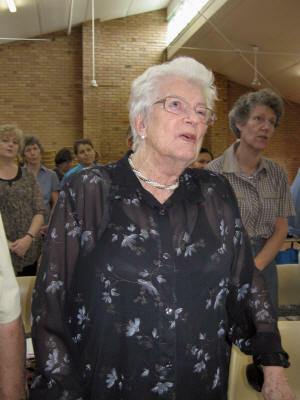 Flash Forward — 2009: Standing in the congregation for a hymn, two rows in front of me, is my frail mother, age 80 in a few months, leaning on her walking-frame. Physically, she is a shadow of what once was. Her voice no longer packs a punch. Not many of those once thrilled by her singing are even alive to remember it. And then it hits me: Her back and shoulders still move involuntarily — rising, falling, swaying mildly, moving with the feeling and sincerity that so typifies her singing. True, I can no longer hear the crisp pitch, the dynamic range and power — nor all the other things that once coalesced into such a technically talented soprano. Then something else hits me: For 20 years I’ve regretted what I can no longer hear. But what has God, who sees and hears and knows all, been “hearing” over that time? Two rows in front, her back and shoulders are still moving; the emotional intensity of love and praise are still there, intact. In fact, they haven’t missed a beat. “These are the ones I look on with favor: those who are humble and contrite in spirit, and who tremble at my word” (Isaiah 66:2). That’s my mother. “As the deer pants for streams of water, so my soul pants for you, my God” (Psalm 42:1). That’s my mother. Then yet another thing hits me, courtesy of hindsight: “The Lord does not look at the things people look at. People look at the outward appearance, but the Lord looks at the heart” (1 Samuel 16:7). Although we enjoyed listening to Mum sing, it was never about her voice, was it? It was never about her performance. It isn’t about our performance. It was always about her heart. It’s always about our heart. I thought I’d learned this from my mother 50 years ago. Clearly I needed to be reminded. And I was — through “hindsight” — two rows behind as her back and shoulders rose, fell, swayed mildly, moving with feeling and sincerity. It’s about the heart, isn’t it?